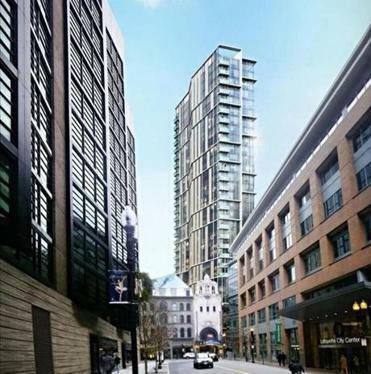 A rendering of Rafi Properties&apos; proposed residential tower on Washington Street in Downtown Crossing. A 25-year-old Boston University graduate with little development experience has proposed an ambitious addition to Boston’s skyline: a slender, 30-story “pencil tower” improbably shoehorned onto a tiny parcel in Downtown Crossing. The builder is Collin Yip, who has a degree in business administration from Boston University and has renovated several small buildings in the North End and Cambridge. The building proposed for Washington Street would be by far his largest undertaking, rising 305 feet on less than one-tenth of an acre, a lot just 38 feet wide across the front. Dubbed “Canvas,” it would contain 94 residences, offices, restaurants, and several co-working and business incubator spaces. The plans, which have already drawn concern from the owner of the neighboring building, were detailed in a letter filed with the Boston Redevelopment Authority on Monday by Yip’s development startup, Rafi Properties LLC. The skyscraper would be built over the former Felt nightclub at 533 Washington St., preserving the façade of the four-story building that’s currently on the site. 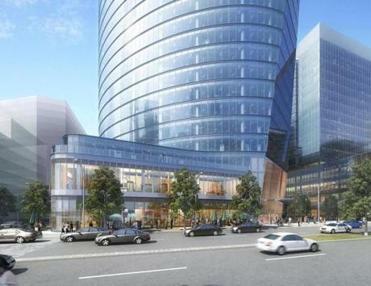 The company thinks its project will fit just fine; it envisions Canvas as a part of Boston’s emerging downtown. The land of boxy buildings that is Boston’s burgeoning Seaport District is about to get some long-desired curves. Read: What makes a good tower? Officials have encouraged the construction of more residences downtown, hoping to expand the city’s tight supply of housing and enliven what was once mostly an office district. They cited the forthcoming 625-foot-tall Millennium Tower, with its 442 ultraluxury condos, as a key catalyst for other residential projects nearby. “More and more, people are thinking of downtown as not just a place to go to work and buy stuff, but as a place to live,” said Erico Lopez, the BRA’s director of development review and policy. And in another tip to the demographic trends changing Boston, the building would not have a single off-street parking space because it is within walking distance of several subway lines and transit hubs. The tower would have a mostly concrete structure instead of the usual steel, which the developer’s architect, Stantec, said should reduce the maneuvering room needed to build on the small, boxed-in property. Even so, the developers acknowledged they would need to close off one lane of Washington Street during construction. The property is sandwiched between two theaters, the Boston Opera House and the Modern Theatre, which is owned by Suffolk University and separated from the Canvas site by a narrow alleyway. The school is worried that construction equipment would clog the alley, making it impossible to access stage doors that are needed to bring large sets and props into the building. Nucci said the developers met with Suffolk’s theater department and seemed willing to work on the issue, but have yet to offer detailed plans that would preserve access to the Modern. Music promoter Don Law, who co-owns the Boston Opera House, was not available for comment Monday, his assistant said. Rafi Properties is little-known in Boston. The company has developed a small residential project in the North End and owns several smaller buildings around Boston and Cambridge that contain residences or space for startup firms. Yip did not make himself available for an interview Monday. A spokeswoman for Rafi Properties said the project would be financed by several individual overseas investors, including some members of Yip’s family. She said the company is still working on construction details and does not have an estimated cost of the building yet. The company does have a major contractor for the proposal. The tower was designed by architects with the former Boston firm ADD Inc., which was acquired last year by Stantec, a giant Canadian building consultancy. But despite the company’s inexperience and Yip’s youth, city officials seem receptive to his plans for the Washington Street property, which Yip bought last year for $7.35 million, according to property records. They also said that the inclusion of Stantec helps give the proposal more credibility. Meanwhile, some nearby residents want the city to conduct a traffic study of the area as it encourages more residential development downtown. “I don’t think there will be outright opposition” to the Canvas project, said Rishi Shukla, a resident of the nearby Millennium Place building and a leader of the Midtown Cultural District Residents’ Association, a neighborhood group. Follow him on Twitter @DanielAdams86.